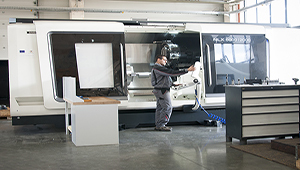 NLX 6000 | 2000 is a high-rigidity, high-precision CNC lathe capable of handling workpieces from large flanges to long shafts by making the most of its large-diameter spindle and generous machining area. Equipped with ample experience and advanced technologies, the model takes advantage of its heavy-duty cutting power to support the construction machinery industry and the energy industry where an oil well pipe is represented as the typical workpiece. Since 2016 we have been producing in our new plant.